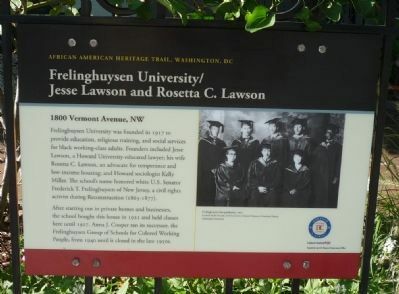 Frelinghuysen University was founded in 1917 to provide education, religious training, and social services for black working-class adults. Founders include Jesse Lawson, a Howard University-educated lawyer; his wife Rosetta C. Lawson, an advocate for temperance and low-income housing; and Howard sociologist Kelly Miller. The school's name honored U.S. Senator Frederick T. Frelinghuysen of New Jersey, a civil rights activist during Reconstruction (1865-1877). After starting out in private homes and businesses, the school bought this house in 1921 and held classes here until 1927. Anna J. Cooper ran its successor, the Frelinghuysen Group of Schools for Colored Working People, from 1940 until it closed in the late 1950s. Scurlock Studio Records, Archives Center, National Museum of American History. on the low fence to the right of the stairs. 38° 54.895′ N, 77° 1.608′ W. Marker is in U Street Corridor, District of Columbia, in Washington. Marker is at the intersection of Vermont Avenue Northwest and 11th Street Northwest, on the right when traveling south on Vermont Avenue Northwest. Touch for map. Marker is at or near this postal address: 800 Vermont Avenue Northwest, Washington DC 20009, United States of America. Touch for directions. Other nearby markers. At least 8 other markers are within walking distance of this marker. 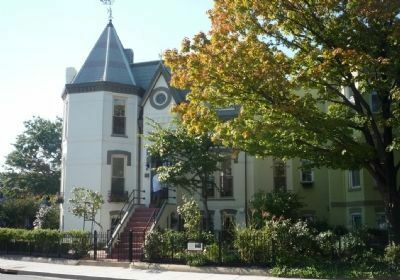 Washington Afro-American Newspaper Office Building (about 300 feet away, measured in a direct line); Howard University Sets the Standard (about 400 feet away); A Home Away From Home (about 400 feet away); Louise Burrell Miller Residence (about 500 feet away); Daniel A.P. Murray Residence (about 500 feet away); African American Civil War Memorial (about 600 feet away); Sailors / With Freedom Came the Greater YOU (about 700 feet away); Pioneers / With Freedom Came Their Community (about 700 feet away). Touch for a list and map of all markers in U Street Corridor. U.S. Department of the Interior National Register of Historic Places plaque, above doorbell button. More. Search the internet for Frelinghuysen University/Jesse Lawson and Rosetta C. Lawson. Credits. This page was last revised on March 16, 2019. This page originally submitted on October 16, 2011, by Richard E. Miller of Oxon Hill, Maryland. This page has been viewed 825 times since then and 20 times this year. Photos: 1, 2, 3. submitted on October 16, 2011, by Richard E. Miller of Oxon Hill, Maryland. • Bill Pfingsten was the editor who published this page.